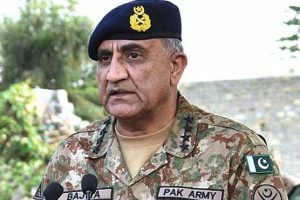 KARACHI: Chief of Army Staff (COAF) General Qamar Javed Bajwa on Saturday visited Headquarters Pakistan Rangers Sindh, where he was briefed about the security situation in the province. Inter-Services Public Relations (ISPR) in its statement DG Rangers Sindh provided brief details on the law and order situation in Karachi to the COAS. The army chief praised the efforts of Rangers Sindh and all other law enforcing agencies for the improved security environment. He said that Karachi is the backbone of national economy and we shall further improve its security environment so that the positive business trajectory is maintained. The army chief was accompanied by Commander Karachi Corps Lieutenant General Humayun Aziz.